Cranberry Cointreau Mincemeat is fresh, fruity and sozzled with lots of lovely booze. It’s also the best choice for your free-from mince pie as it doesn’t have any pesky suet ruining things for the vegans, it’s nut free for our allergy afflicted friends and if you’re gluten-free you don’t have to worry about where to source your gluten-free suet. 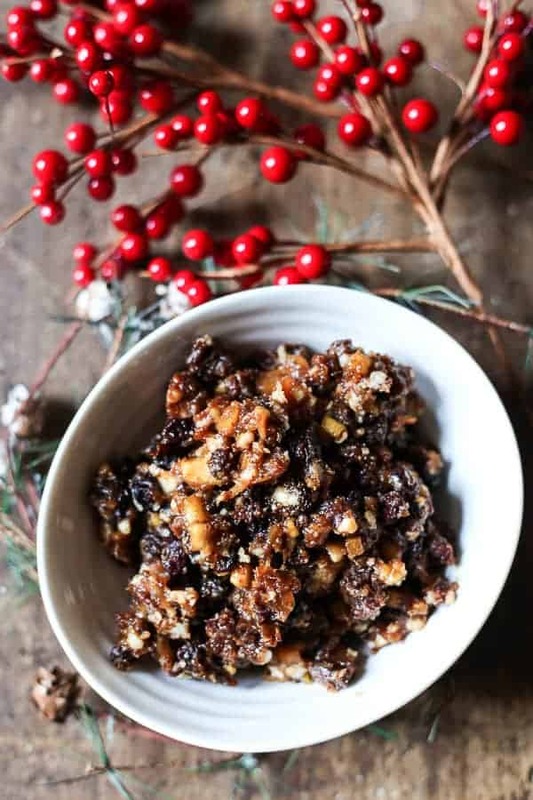 This Cranberry Cointreau Mincemeat is a re-post from a recipe that I published in 2013. I make this recipe every year to sell on my market stall and for personal use in my mincemeat recipes that require no suet such as Bramley Apple and Mincemeat Pudding. I have kept the below text as written four years ago for posterity. I can’t believe the John Lewis ad hee haw is still going as strong as ever. It all starts here people. I was watching the ad breaks during X Factor on Saturday and they were very clear that we have now been given the all clear on Christmas. Have you seen the John Lewis ad with the hare and the bear? Well I didn’t understand it but it still made me cry. If John Lewis think it’s Christmas then it must be. Finally I will stop being embarrassed that I have been listening to Fairytale in New York since November 1st, I can dust off Delia’s Happy Christmas and henceforth will step into Christmas. Well, Christmas food at least, but that’s all I care about anyway. So if you’re not ready to start thinking sleigh bells and winter wonderlands then I shall simply call you a miserable scrooge and that is all. No, don’t go, I’m sorry for not understanding that everyone isn’t totally into the carols and commercialism (ahem, family time) as much as me. But in my defence I am making mince pies for our WI Christmas themed meeting on Monday so really I am leaving it quite last minute to whip up the mincemeat. I am making two different types of mincemeat this year and this is the first one. It’s veggie and nut free and very quick to boot. I was going to make Dan Lepard’s Dark Rich Mincemeat as I wanted to steer clear of suet for mincemeat number one and his take on it sounded delicious but I couldn’t find any dried sour cherries. Even a trip into town and my trusty pocketrobber Whole Foods had run dry, though I did get to see the Carnaby Christmas lights so the trip wasn’t a complete bust. But still, I needed something sour to counterbalance all the sugary fruit. So I added fresh cranberries which seemed to do the trick, not breaking them up too much in the mix so they burst in your mouth, immediately quelling the layers of fruity sweetness. With dried and fresh cranberries all stirred up I couldn’t help but think of adding some sort of orange note since it’s a natural pairing with cranberries. When it’s Christmas you should always reach for the bottle so I poured in a good glug of Cointreau, my favourite Christmas tipple, which happily is made from oranges. Then it tasted so good, so I added a bit more. Then a bit more. Then I poured myself a small glass and the rest is history. Cranberry Cointreau Mincemeat is fresh, fruity and sozzled with lots of lovely booze. Pour the fresh cranberries, sugar, ale, bramley apple, lemon juice and zest and all the spices into a large saucepan and bring to the boil. Simmer for 10 minutes until some of the cranberries start to break down. In a large mixing bowl add the dried fruits and the dessert apples and add to the boiled mixture. 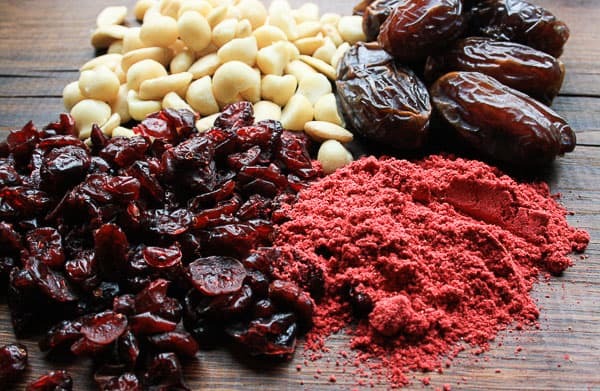 Remove from the heat, add the dried fruits and give a very good mix through, making sure the prune paste is evenly dispersed. Leave to cool completely before stirring through the brandy and Cointreau. Decant into sterilised jars and store until ready to use or use straightaway. Fancy more mincemeat recipes? Then treat yourself to traditional Victorian Mincemeat which uses real beef mince for the richest and most decadent mince pies this Christmas. 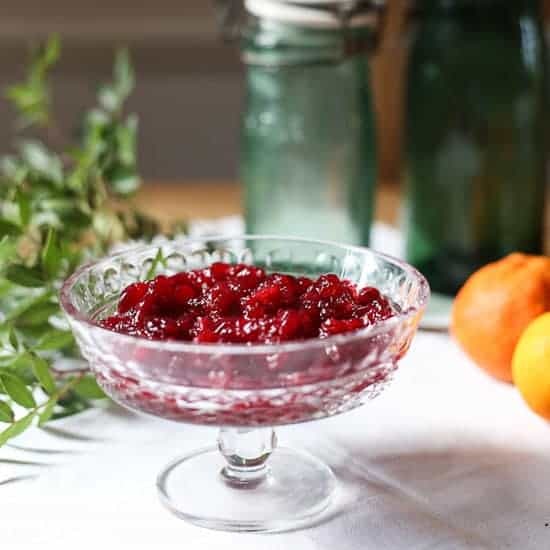 Homemade Cranberry Clementine Sauce is the perfect accompaniment to the festive turkey. 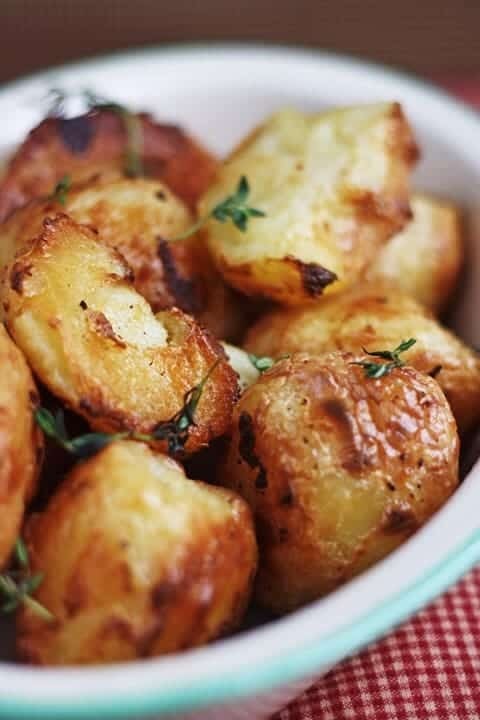 The bright shiny flavours are enhanced by a touch of spice. It’s about time that I came clean here on the blog with what my deal is at the moment. A lot of my posts have been late, if they have been posted at all and my Gluten-Free Flour series went on a rather long sabbatical. If you follow my market stall then I basically opted out of late summer/early autumn then upped sticks to a completely different market. Back in July I was ahead of the game, I had managed to carve out a good amount of time of pure recipe testing, writing and photography and had posts planned for about 6 weeks ahead. I was intending to return to posting twice a week to get through all the recipes I wanted to share and things I wanted to say before the year was out. It was all going swimmingly. Then I was struck down with both the most amazing news I had been wishing so hopefully for and the most debilitating morning sickness imaginable. Yes, I am expecting again and by goodness this new addition wanted my whole life to be put on hold whilst he settled into his temporary home for the next forty weeks. I could barely raise an arm out of bed, I couldn’t eat and when I did it was a huge mistake. All I was fit to do was sleep and my whole body felt wretched. Any ounce of energy I could dredge up from the depths went to ferrying Cole around to family, friends and nursery, anyone who could actually look after him whilst I went into complete hibernation and felt like the worst, most pathetic mother alive. It took about 16 full weeks until I felt reasonably human. With the aid of my lovely husband I only managed to miss about 6 weeks of cake stalls. I had to change markets though to one much closer to home to suit my new exhausted and sickly state of being. Although this actually has turned out to be a great decision despite having to say goodbye to my lovely market at Tottenham Green. I’ve now had about a month of being okay, although of course with the next phase of pregnancy comes other challenges. However, I’m now well, eating healthily again and happy to be baking and preserving for all the festive markets on the horizon. Plus if you were reading with intent earlier in the post you’ll notice that we’re having another boy which fills me with so much excitement. Cole is simply the best little human in the world so to have two of those sounds like a dream. A dream in which the house is filled with double the amount of shouting, troublemaking, carnage, toy cars, fire engines, trains and Paw Patrol paraphernalia and where I am being constantly climbed on, grabbed, poked, pulled and run ragged. Wait, is that a dream or is it something else? So all this is to excuse why my Cranberry Clementine Sauce recipe is coming the morning of Thanksgiving when anyone celebrating this holiday already has their cranberry sauce well and truly sorted. But hey, it’s lucky I live in London as we don’t need our cranberry sauce until Christmas Day so with those timings in mind I am super organised. I had never been terribly bothered about the inclusion of cranberry sauce at Christmas until I began making my own. The syrupy sweet congealed sauce that is dolloped obligingly out of a jar is light years away from the ruby red zesty rich cranberry sauce made with fresh cranberries, a touch of citrus and a whisper of spices. Homemade Cranberry Clementine Sauce is also one of the easiest ways to take your festive feast to another level. 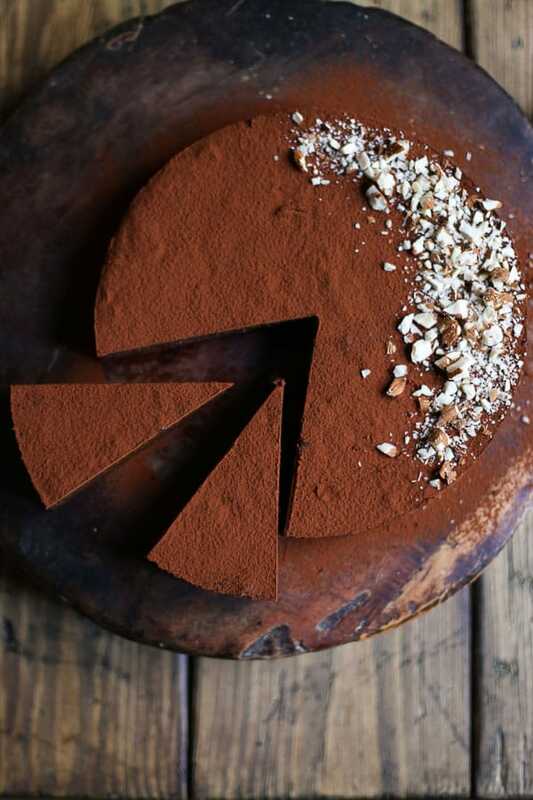 It adds more than just sweetness to your plate as it seems to make everything taste fresher somehow. Since I began making it myself I have become a little obsessed with the stuff and now deem it a non-negotiable accompaniment to most of my meals throughout November and December. This recipe also keeps really well and I load up the fridge with jars so I still have plenty to delve into well into next year. Pour the water and sugar into a saucepan and simmer for 5-10 minutes until the sugar has dissolved. Add the cranberries and simmer for 5-10 minutes, stirring well. Once the cranberries are just beginning to break down then remove from the heat and stir in the spices and clementine zest. Chill the sauce until needed. I find this Cranberry Clementine Sauce keeps for an inordinately long time in the fridge since the sugar syrup preserves the sauce very well. You can easily make this sauce weeks in advance, although there’s no guarantee there’ll be any left for Christmas Day if you do that. I have also had great success in canning this Cranberry Clementine Sauce via the water bath method to ensure extra longevity. After all, I still want to be eating my cranberry sauce well into June next year. This recipe was adapted from a cookery class I attended many years ago at Divertimenti Cookery School in London. I have long since lost any details regarding the original writer of this recipe or which cookery class it was exactly I attended. It’s a pretty safe bet it was some sort of a Christmas cookery class though. 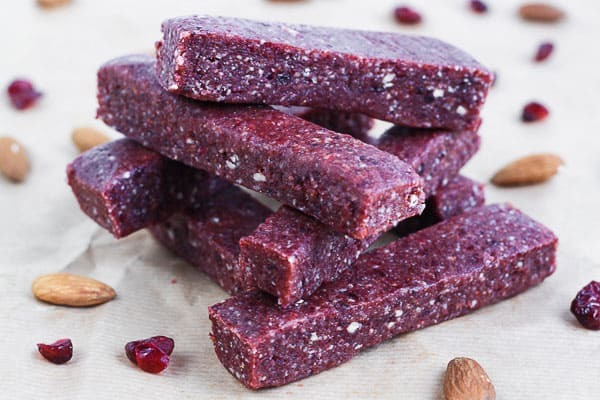 Raw Cranberry and Nut Energy Bars are vegan, gluten-free and sugar-free. 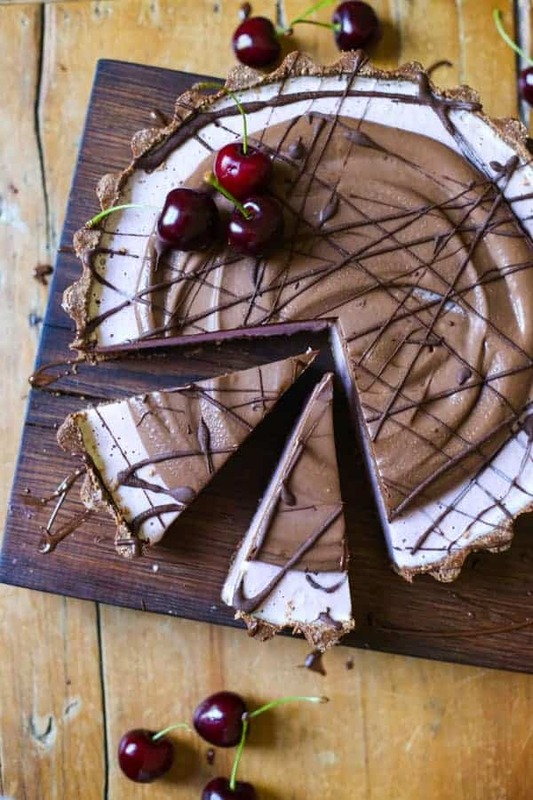 Full of protein and bursting with fruity flavour. I make no bones about it, these energy bars have been shamelessly ripped from the Nakd bar. I was completely reliant on Nakd bars when I worked as a TV Producer. I was either too busy to have breakfast so I grabbed one of these, maybe I had edits that ran over lunch so I kept going by pulling one of these out of my bag, or I was working late which meant that dinner was pushed until I got home at some heinous hour and my Nakd bars would once again save the day. I always had heaps of them crammed into my desk drawer, handbag and coat pockets. Since I’ve been working from home, I haven’t found the need to rely so much on shop bought snacks, there is usually cake around or I’m recipe testing so I can munch on a bit of whatever I’m cooking or baking. Can you tell I was a bit more diet conscious when I wasn’t slouching around in tracky bums, baggy t-shirts and slippers all day. Well, I’m upping the health factor in my life at the moment, making sure I achieve my 5-a-day, consume my 700mg of calcium and perhaps not rely on chocolate to fill the spare five minutes I have whilst waiting for the kettle to boil. 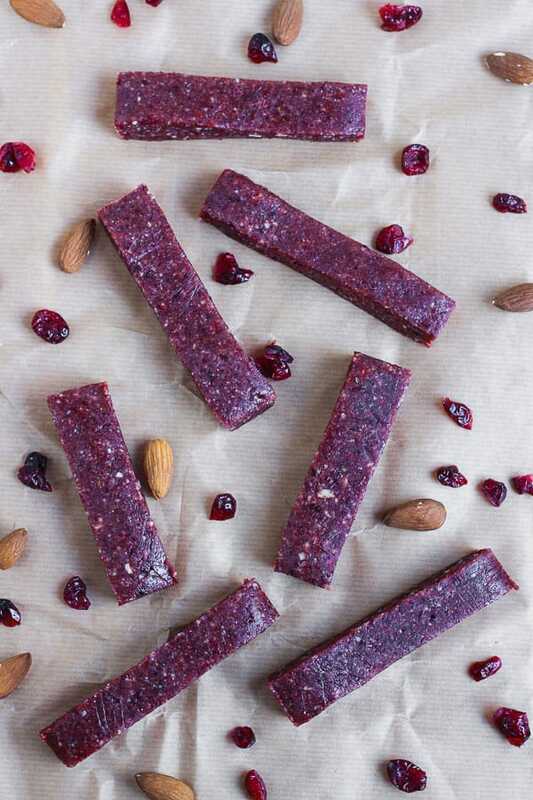 With healthy eating comes healthy snacking so although I won’t rely on these bars like I used to it’s incredibly handy having something in that I can have if I need a sugar or protein hit. If I’m going for a long walk with Billy Buddy then I find that one of these is absolutely perfect for my dipping energy if I’m getting pulled around by an excitable little dog. Having exhausted all the flavours of Nakd bars during my obsession with them I always wanted to give them a go myself, after all there is only about four ingredients listed on the back of the packets. I should have carved out time to do this years ago, as they were one of the easiest things to prepare. 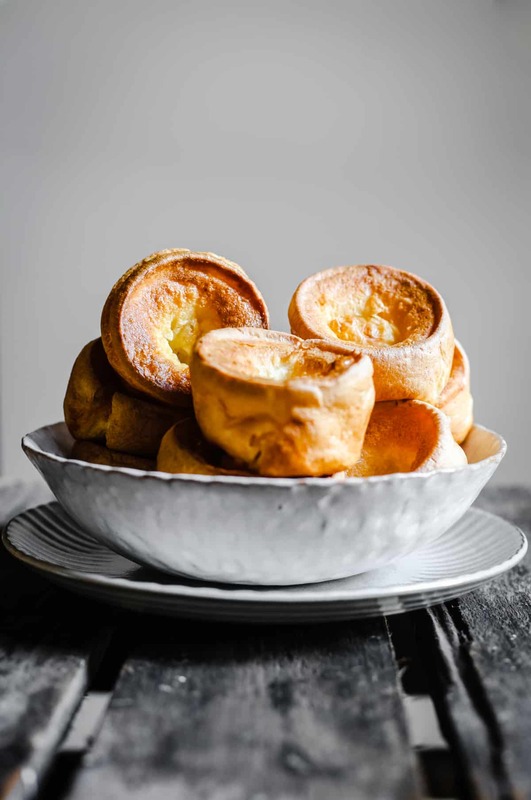 If you own a food mixer then that’s all you need to whizz up the ingredients before you press into a tin, refrigerate and then cut into bars. When I set about making these I didn’t have any particular plan in mind other than I wanted to use up some of my dried cranberries; I severely overestimated how many I would need over Christmas and my larder is overrun with them. I love cranberry and macadamia together and then found buried in the back the remains of a packet of macadamias which hadn’t gone out of date yet – score! There weren’t quite enough nuts so I amped up the quantity by substituting almonds. 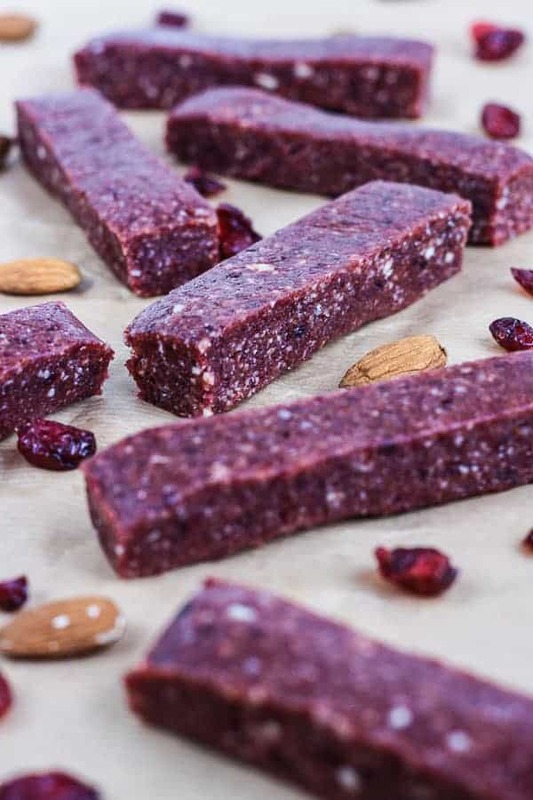 I also added dates which are the main ingredient in any Nakd bar to bind the bars together, I used plump sticky medjool dates to add juiciness and deeper flavour. There are more dates than cranberries in this recipe but the dates add the background note whilst the overriding zingy flavour is of the cranberries. I couldn’t resist adding a tablespoon of freeze dried raspberry powder either for more berry flavour. They worked out better than expected. 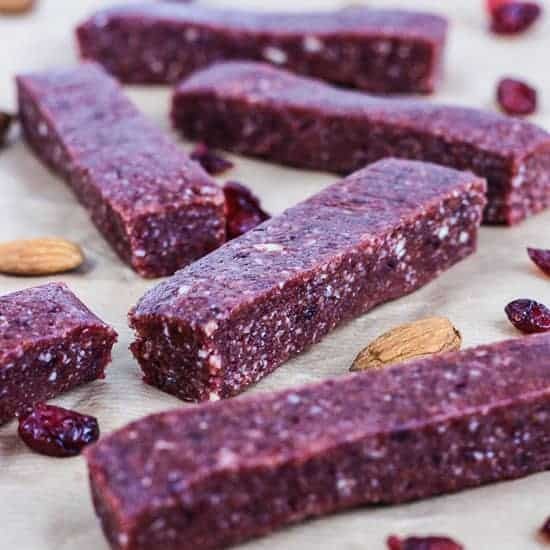 The raspberry powder lifts the whole bar so it tastes fresher somehow. You can get raspberry powder from Father Christmas when he puts it in your stocking to open on Christmas morning or if you weren’t quite as lucky as I was then it’s easy enough to buy online. 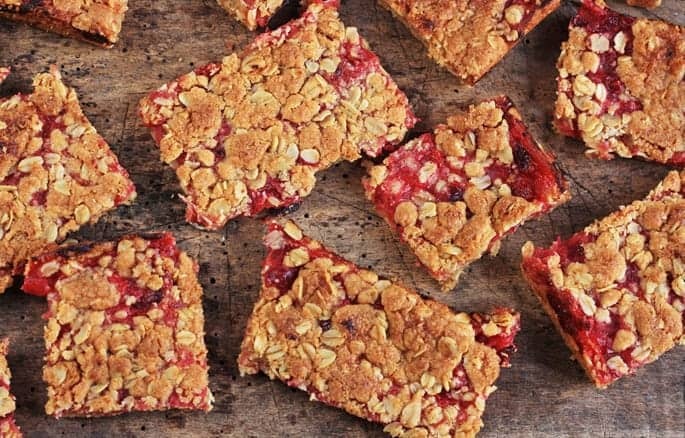 These bars should keep for about a week in the fridge but you could also double the quantity I’ve suggested here and stick them in the freezer so you have lots to keep you going. I made mine in a smaller quantity of eight so I can move onto another flavour when these are done. Line and grease a 5 x 5 x 3 inch* square baking tin with two long pieces of baking parchment so they cross in the middle and come up and over the sides of the tin. 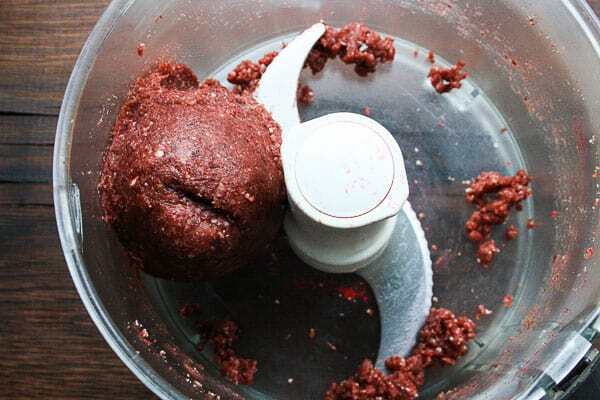 Place all the ingredients in a food processor and combine for 3-5 minutes until all the components have broken down and come together into a sticky ball. Tip the mixture into the baking tin, press down on top so the surface is even. Place in the fridge for a couple of hours to firm up then carefully remove from the tin, using the long ends of the baking parchment as leverage and cut into 12 bars. Store the bars in the fridge in between snacking for about a week. *I originally used a different baking tin for the bars made in the photos. This tin will make slightly wider shaped bars.
. It’s a lovely product and I find freeze-dried raspberry powder useful in so many recipes, from buttercreams to sponge cakes and also in homemade beauty products like lip balm – basically anytime I need a hit of raspberry without using fresh fruit which isn’t always appropriate.
. I have easily had it over ten years and I use it nearly every day for whipping up dips, pestos, nut butters, nut and oat flour and making my breadcrumbs. The Magixmix is an impressive piece of kit which even survived being dropped when we moved into our house (although it did have to have the motor replaced but that wasn’t too expensive). I put all the attachments in the dishwasher and they come out brilliantly clean but it also gives just great results. I love my Magimix and along with my Kitchenaid is the piece of equipment I use most often in my kitchen. 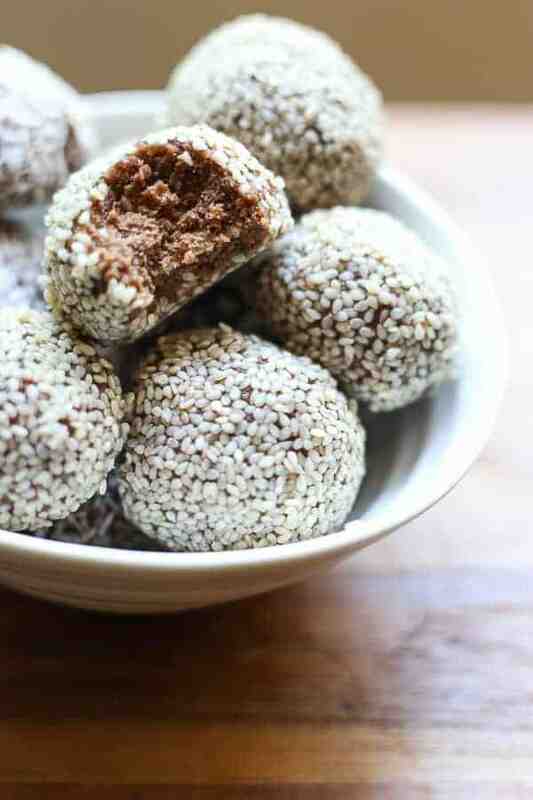 Energy Boosting Snack Ideas – FREE PDF! 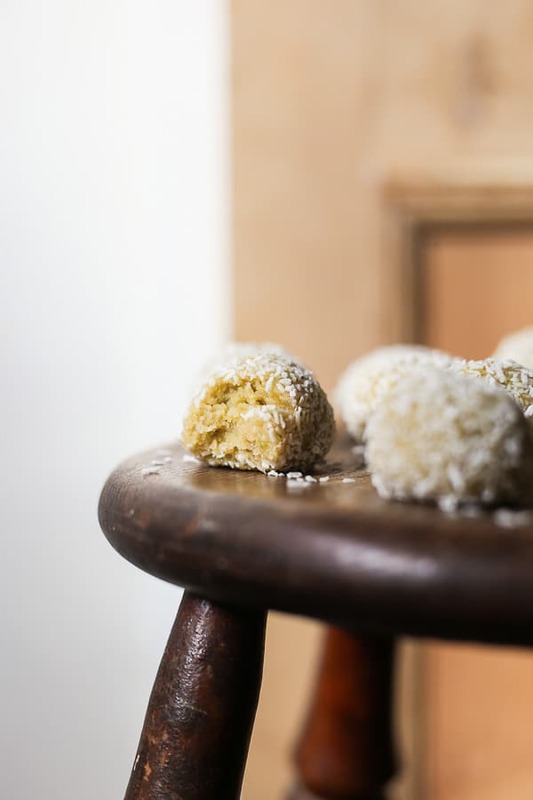 If you need more inspiration of energy boosting snacks to get your through your in between meal slumps then you can download my free PDF with 9 more ideas featuring exclusive content and also my favourite energy boosting recipes from the website. To access this amazing PDF you just need to click the link below! !